Abang Johari (fifth left) and Abang Abdul Wahap (fourth left) pose for a photo with the Friendly Neighbourhood Award winners. KUCHING: Kuching North City Commission (DBKU) is currently holding various activities till March 31 to commemorate the launching of its Old Kuching Smart Heritage Agenda. Datuk Bandar of Kuching North Datuk Abang Abdul Wahap Abang Julai said among the activities are ‘Malam Kebudayaan Warisan’ and exhibitions involving government and private agencies as well as communities involved in DBKU’s ‘Friendly Neighbourhood’ initiative. 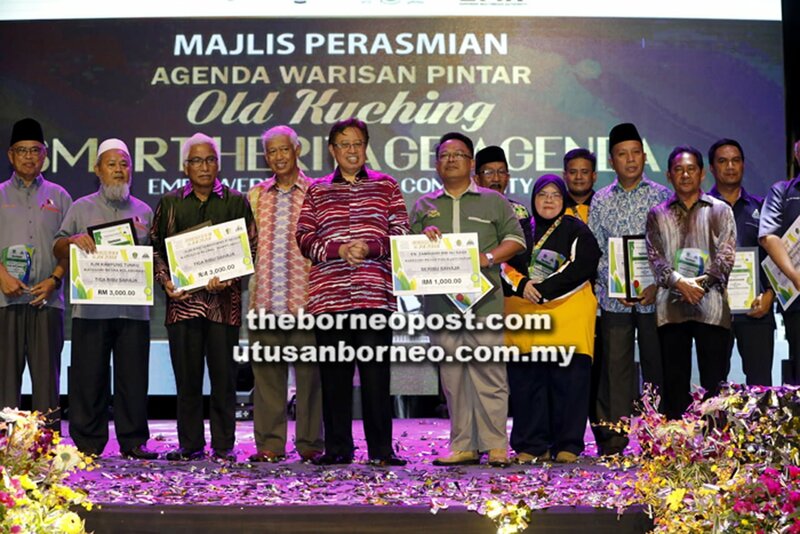 “There are many other beneficial activities like sports, entertainment, e-contest, Kuching Got Talent and Heritage Kitchen,” he said at the launch of DBKU Old Kuching Smart Heritage Agenda at Kuching Waterfront on Wednesday night. Abang Abdul Wahap added that the agenda is a symbol uniting Sarawakians towards digital economy while maintaining Sarawak’s cultural heritage. The event, which was launched by Chief Minister Datuk Patinggi Abang Johari Tun Openg, also witnessed the launching of ‘Beautiful, Clean and Safe Improved Plan’ and radioKU – the first local authority to have its own online radio station. At the event, appointment letters were presented to 10 Friendly Neighbourhoods for 2018-2019, along with the Friendly Neighbourhood Award presentation. Among those at the event were State Secretary Tan Sri Datuk Amar Mohamad Morshidi Abdul Ghani; Minister of Tourism, Arts, Culture, Youth and Sports Datuk Abdul Karim Rahman Hamzah; Miniser of Local Government and Housing Datuk Dr Sim Kui Hian; and Assistant Minister of Tourism, Arts and Culture Datuk Lee Kim Shin.